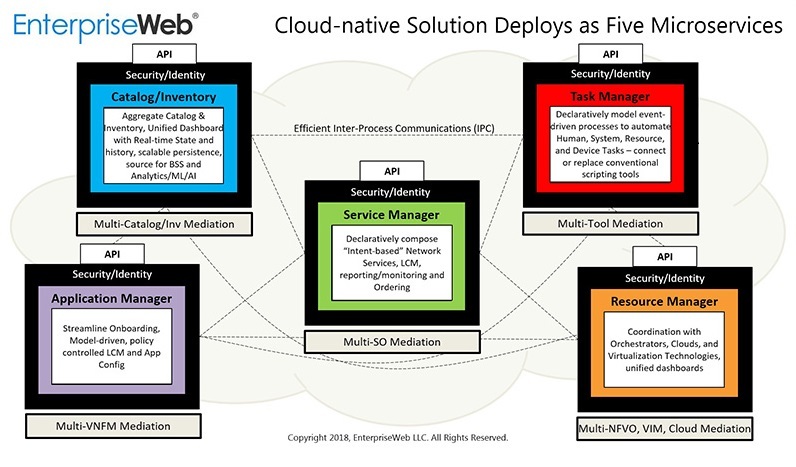 "CloudNFV" is EnterpriseWeb’s award-winning solution for network and service management automation, based on the company’s Digital Business platform. The Company won “Best NFV Interoperability” at Layer 123’s SDN & NFV World Congress at the Hague (October, 2017) and was recently awarded Light Reading’s Leading Lights “Best NFV Product Strategy” (May, 2018). EnterpriseWeb is now leading an ambitious new Proof-of-Concept for ETSI Zero-touch Network and Service Management. CloudNFV is a Cloud-native product, which deploys as five autonomous Microservices for independent scaling, high-availability, portability and resilience. Each module represents a major functional area that aligns with general software product categories and typical IT roles. Application Manager (AM): Streamlines onboarding of VNFs (and PNFs) and bundling with their artifacts and images, without requiring any vendor code modifications. It supports authoring adaptors for VNFMs and other software dependencies. Service Manager (SM): Rapid declarative composition of “intent-based” (i.e. infrastructure independent) Network Services, which support hybrid/multi-cloud deployments. The module can perform service orchestration directly, or delegate orchestration to a federated 3rd-party component. It supports advance zero-touch lifecycle management capabilities. Service Manager exposes an API for communicating with Business Support Systems. Resource Manager (RM): Author adaptors for Hosts Model and VIMs. Existing adaptors for Openstack, VMware ESXi, Kubernetes, Azure, AWS, GCP, etc.). The module can provide resource orchestration directly, or delegate orchestration to a federated 3rd-party services. Task Manager (TM): Model event-driven dataflow processes to automate human, system, application, and resource tasks with a unified tool. It can provide workflow services directly or delegate actions to 3rd-party tools and runtimes (existing adaptors for Chef, Puppet, Ansible and Python). Active and Integrated Catalog and Inventory (AICI): Catalog provides a registry of onboarded VNF Packages, which links to Active Inventory of deployed instances and their configurations. It exposes an API for higher-level Analytics, AI and ML and exposes an interface to synchronize other Catalog and Inventory systems for an aggregated view.